Jobs with The Massage Company, We’d love to hear from you. We really invest in people. We understand that training is the future of our business. Our TMC Training Academy is a growing part of our focus, and every Massage Therapist will undergo both training and live practice before working with us. For Membership Sales Supervisors, we offer a full and complete induction, operational and sales training, and the chance to be part of a dynamic and exciting new business here in the UK. Click through onto our roles below, to see if they appeal to you, and then contact us if you want to join the team! See our current vacancies which are listed below the descriptions. The Massage Company™ is looking for good quality massage therapists for our multi-award winning flagship centre in Camberley. We operate a unique membership concept. We believe you should look forward to coming to work, then have a professional, active and healthy environment when you get there. A successful TMC therapist is passionate about bringing high-quality massage to the mainstream, transforming it from the occasional or a treat to a routine and vital part of a better and balanced life for our customers. 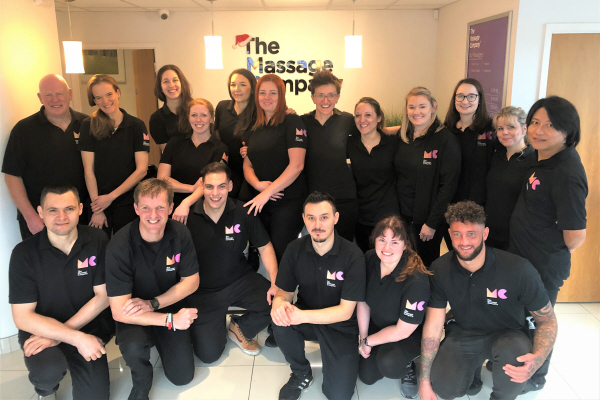 The Massage Company™ is looking for a great Membership Sales Supervisor to help lead our exciting, new massage concept at our flagship centre in Camberley. With other sites opening soon, further career development is a real opportunity. We believe you should look forward to coming to work, then have a professional, active and healthy environment when you get there. A successful TMC Membership Sales Supervisor will share our passion for bringing high-quality massage to the mainstream; transforming it from the occasional or a treat to a routine and vital part of a better and balanced life for our clients. The Massage Company™ is looking for an ambitious Assistant Manager to help lead our exciting, new massage concept at our flagship centre in Camberley. With other sites opening soon, we expect this role to progress into a Centre Manager position, or into a new site openings role or a combination of both. We believe you should look forward to coming to work, then have a professional, active and healthy environment when you get there. A successful TMC Assistant Manager will share our passion for bringing high-quality massage to the mainstream; transforming it from the occasional or a treat to a routine and vital part of a better and balanced life for our clients. The chance to learn and develop under the initial guidance of our Founder who will be the Centre Manager at opening. Professional and personal career opportunities to be promoted to Centre Manager or take a lead role in the openings of other new TMC sites. Supporting the Centre Manager in establishing operational processes and teaching The Massage Company ethos.